Businesses can always rely on Nutcracker Sweet Gift Baskets for all of their corporate gifting needs. We have professional and courtesy corporate representatives ready to help you create your corporate holiday gifts. No matter how big or small you wish your gift to be, our professional corporate designers will be able to craft it. We understand that your holiday list can be super long however, we are reputable for our ability to stay organized and conquer your gifting requests! We ensure that all your holiday gift baskets are crafted beautifully and with care so that they make an amazing impression to all recipients. Also, we can provide logo ribbon for all occasions, including holidays, thus, personalize your holiday greeting with our logo ribbon service. We are prepared to handle all your gifting inquiries, despite the time of year! Our company aims to be your one stop gifting solution! Each and every corporate holiday gift basket is designed with careful attention to every detail and in addition, our team is extremely efficient to ensure we fulfill all your needs! 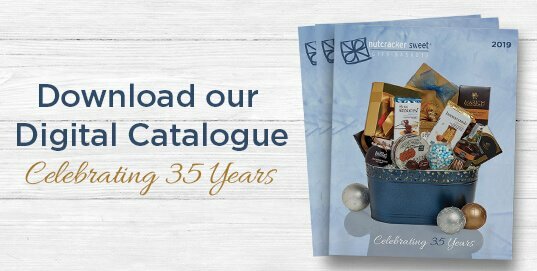 Nutcracker Sweet professionals will go above and beyond to maximize your satisfaction thus, we hold ourselves accountable crafting the perfect basket which includes, the best quality products and often, additional order specifications. To further, if any company wishes to add personal items to the gift basket, our Nutcracker Sweet team will do our very best to fulfill those requests. We assure that we are able to cover any of your holiday gifting requests right here, at Nutcracker Sweet Gift Baskets. We are dedicated to bringing your design visions to reality and we do this without putting a single worry on your table! Thus, we make gifting an easy and quick experience for you. We can also help you design your very own personal holiday gift basket collection therefore, you will be sending perfect custom handcrafted gifts to all your recipients. Nutcracker Sweet guarantees that any of our gift will put smiles on all your gift recipients! We hand wrap and arrange all of the corporate gift baskets to ensure they will be stunning and leave your recipients speechless. Not only will the recipients have a smile on their face but, so will your incredible corporate specialists! Our Nutcracker Sweet team members are always excited and happy to assist you with all your gift design requests and we take pride into successfully putting your vision into our marvelous baskets. Nutcracker Sweet strives to bring a ray of sunshine and smiles with any your company’s holiday gift baskets. All of our corporate holiday gift baskets are handmade and filled with only the most delectable and freshest chocolates, crunchy nuts, and gourmet treats that your recipient will not be able to resist. Every corporate holiday gift basket will be filled with only the highest quality items and additionally, we are constantly searching and updating our selections to bring you the best and latest gourmet goodies. Every item in your corporate holiday gift baskets will never be just ordinary thus, find chocolates that taste heavenly, rich and gourmet delights that are enchanting and fresh! 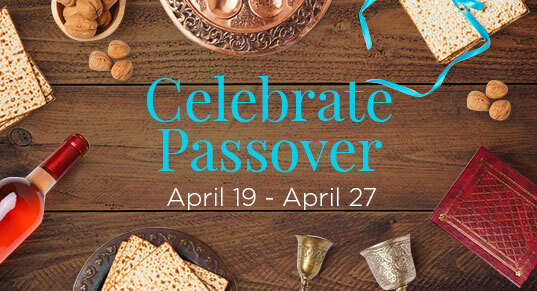 Your recipients will be mesmerized by your gift basket! Nutcracker Sweet is always happy and excited to assist in all your gifting needs. Whether it be a small gift or large gift, we promise that your holiday gifts will look stunning and extraordinary to any recipient. 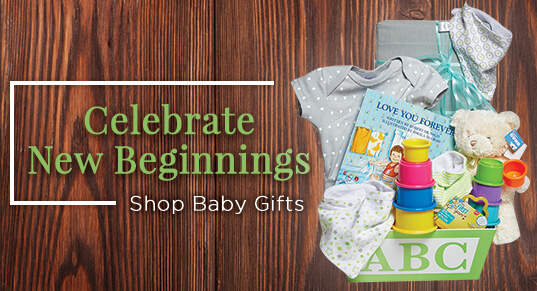 We have 35 years and counting of experience crafting and designing handmade gifts that will always impress and bring smiles to everyone. 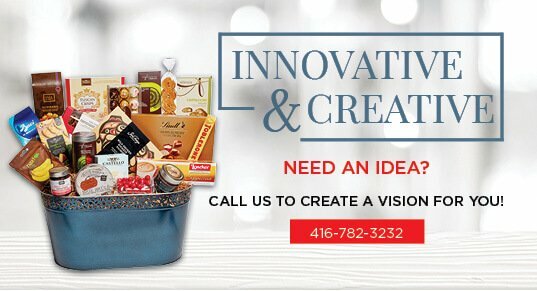 Call us today at 416-782-3232 to speak to any one of our professional corporate gift specialists today, we promise we will be ready and excited to help design your future holiday gift basket collection.